We drove to pick up our CX chicks a week ago bringing home 309 birds. You know all those horrible things you hear about CX chicks? How fragile they are? How many chicks do you think we lost this week? They are doing great. I don’t want to brag or claim that Julie and I are the best in the world at brooding chicks. There are a couple of things we have learned. First, we have been lucky so far. Second, CX don’t deserve their reputation. Chicks die. That’s kind of what they do. I don’t know that CX chicks are any better or worse than another breed on day 1. If you do anything wrong you will lose birds of any breed. Third, not all CX are created equal. Whatever Ross cross Schlecht hatchery hatches are perfect for our style. We have tried birds from other hatcheries. We had one batch from somewhere else that slept with their face in the feed and really never moved. No thanks. Fourth, it pays to drive to the hatchery. Well, it costs a lot to drive to the hatchery. I could lose 20% of my chicks before I began to pay for the fuel I used to drive to Iowa. SO it doesn’t pay. But it does pay because I didn’t kill 20% of my chicks. They are all alive and that’s a big boost to farm morale. Fifth, make sure they get plenty of protein. We add in enough fish meal to make the feed 21%. Fertrell has a recipe to help you make the adjustment. For brooder chicks needing a 21% protein chick starter mix, add two pounds of fish meal to 20 pounds (or a five-gallon pail) of 19% Broiler Grower. I have known folks to raise non-CX chicks on 21% feed all the way through. You can’t do that with CX. You’ll end up with a bunch of flippers. Cut the protein back to 19% after two weeks or you’ll be sorry. Sixth, don’t skimp on the riboflavin. We drop in hay chaff we dust off of the mower after each hay cutting, loaded with all sorts of weed seeds. If your chicks are crippled with clenched claws or are waddling around on their legs, not their feet, you haven’t provided enough riboflavin. This was pointed out in Pastured Poultry Profits. We have really only seen this one time, with an early batch. Ever since that batch we have included Poultry Nutri-Balancer in our chick ration. Also, we have given plenty of green material and seeds and we rarely have an issue. Beef liver and kelp make good alternatives. I might say PNB is the six and a halfth item on this list. Let’s talk about the brooder. Here it is from the outside. It’s a retired pig nursery. The building should have power but…well, it doesn’t right now. It’s a small, insulated box that is surprisingly easy to warm with heat lamps, body heat and composting bedding. More on that last one in a minute. Inside of the building we just took apart the pig pens and moved the feeders out of the way, making room for 300 gallon water troughs. 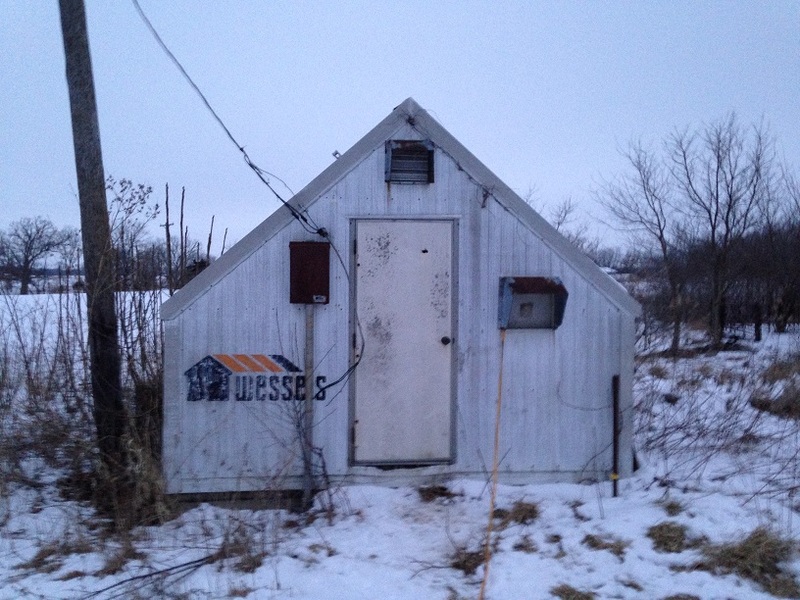 To help trap heat when the temperature is below 0 F we keep scrap tin on top of the troughs. This is both low-cost and effective. What more could you want? We try to keep one lamp per 50 chicks but this is easy to adjust. If the chicks are all huddled together under lamps, suffocating each other trying to stay warm you need to make adjustments. If they are all spread out panting and trying to cool off, make adjustments. The photo above is what we needed to see happy chicks running around, eating, drinking, scratching and napping comfortably without piling. The chicks can tell you what they need but you have to be attentive or they will die. I agree with Salatin’s notion that birds that die in the first 5 days were either defective or mishandled by the post office. After that, it’s all on your management. The first week we are fine putting 150 chicks in a 300 gallon tank but week 2 we try to split them into a third tank. That’s a little more difficult than just moving the chicks because the third tank is not warmed up. We have to shovel out a portion of composting bedding from both active brooder tanks to help jumpstart the new space. 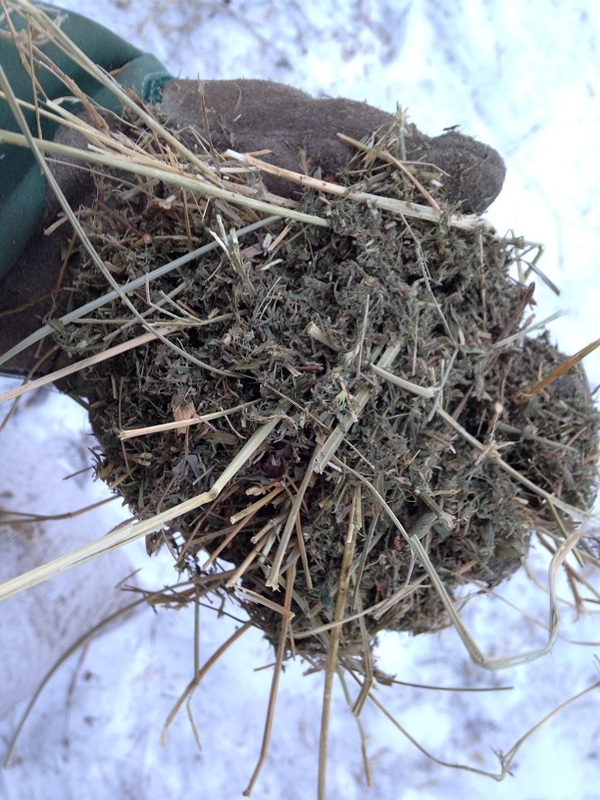 We usually toss in a little fresh horse manure too…just to add a little more diversity to the compost biology. Each day we add fresh sawdust and a couple of handfulls of hay chaff. Julie feels health is improved by stirring up the bedding regularly, mixing old and new, keeping things more fluffy than matted. The jury is still out from my perspective. Otherwise we keep the water and feeders clean and full. That’s really it. We have brooded chicks in a square box. We find chicks tend to pile up in the corners. Watering troughs solved this for us. 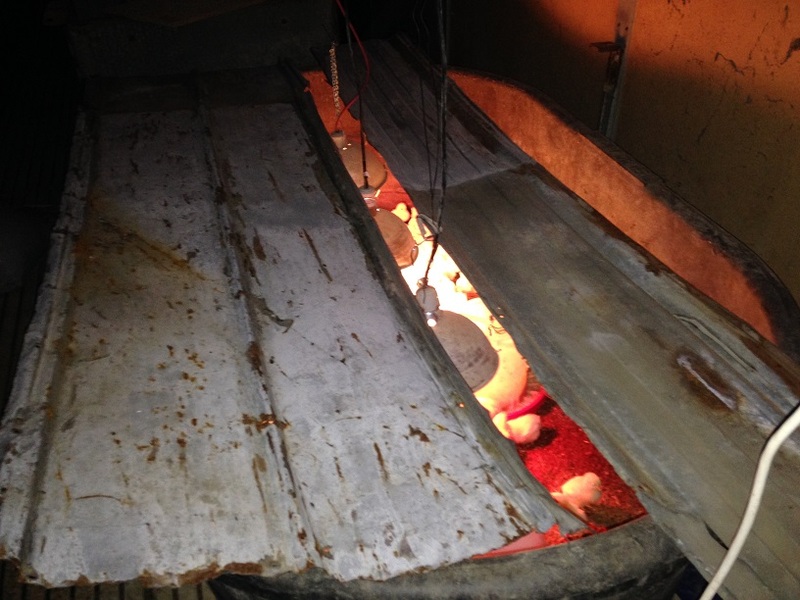 We have brooded chicks under 4′ X 4′ hovers in the greenhouse. That worked really, really well one year, much less so the next year. Our greenhouse fluctuates greatly in terms of temperature and is hard to make cat-proof. So. We don’t do that anymore. We have brooded chicks in our back room (not recommended), our garage (less than ideal), our garden (not bad, seasonally) our greenhouse (already covered that one) and now in the pig nursery. I love brooding in it. It’s so choice. If you have access to an unused nursery I highly recommend using it (h/t to Ferris Bueller). There is one thing we like to do but have been unable to do to this point. We like to provide our chicks with creek sand. The creeks are Frozen so to this point…we have just…wait for it…Let it Go! LOL. I crack myself up. Good luck brooding your chicks. It doesn’t always turn out this well. But when it does, I hope you crow about it. Thanks for the ideas. We are just getting ready to order and start our chicks. Don’t have a nurserry, but a poly water trough will work I hope. So not ready for chicks yet…envious that you will be done when I’m just getting started. great job, no deaths! YAHOO!!! I just LOVE the setup. Does a pig nursery have a solid floor so you don’t have to worry about burrowers? I too give my chickies green stuff from day 1 and find it really helps them know what to dowith grass and weeds when they go out on pasture, didn’t even really think about the riboflavin specifically. I love raising the cornish cross and proving all the haters wrong. Plus having a herd of the white basketballs running to me when I call “Tubbies” is probably the most adorable thing ever. here’s to spring coming soon. Curious if you mix your own ration or if you are buying it. We’ve been purchasing it from our local feed store in Oregon, WI but would like to move to our own ration. If so, how does it break down and where do you get all the components. Well, I suspect it’s worse than that even. I live in the capital of corn and beans so if I want I can just pull my grain wagon across the street when the combines are running and buy at the price per bushel. Let’s make the math simple and say there are 50 pounds of corn in a bushel, same for beans. The Fertrell recipe linked in the post calls for 10 parts corn, 6 parts bean ,1 part oat and 1 part alfalfa meal. That’s 18 parts so basically the first 1,000 pounds of feed is corn. Corn is currently priced at $3.80. Beans are at $10.24. To make our first ton of feed we need $76 for corn and $144 for beans. Let’s say the oats and alfalfa we need run another $20. Just throwing out a number there. Let’s tack on that $60 bag of PNB. Now our ton of feed costs us $7.50 per bag. But we have to run the tractor, spin up the grinder and deliver it without the convenience of bags. Also, I used a raw soybean and the recipe calls for toasted beans. I could have my beans toasted (sounds like a euphemism) at a mill a few towns over but I don’t know what it would add to the price. When we were making feed ourselves (mistake) we bought toasted beans for $20 per bag. I have a spreadsheet that shows a cost of something like $13.50 for broiler feed. The mill makes it to my specification now and puts it in bags for a little more. I can’t imagine what you have to pay for grains out there. Years ago, we made our own feed for $13.50. That was a waste of time and resources. Find a mill you can work with. Yeah, we can drive across the road too and get any grain we want. Madison area still has quite a few grain farmers left and every farm around us is just grain, mostly corn and beans. Our current layer ration costs $10.44 a bag delivered. I think my calculating spreadsheet says it’ll cost around $11/bag at market prices but yes there is a lot of tractor and other work. Or we could grow our own and drop the price down to $7.50/bag but again, a lot of work to do. Does your mill get the Fertrell minerals on their own? No. I have to meet with my distributor out of Kansas City. Requires some planning.